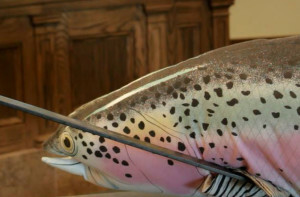 CEDAR CITY – Tempers flared at Wednesday night’s explosive Cedar City Council meeting after Cedar Knolls area residents accused council and administrators of telling “fish stories” to deliberately deceive the public. 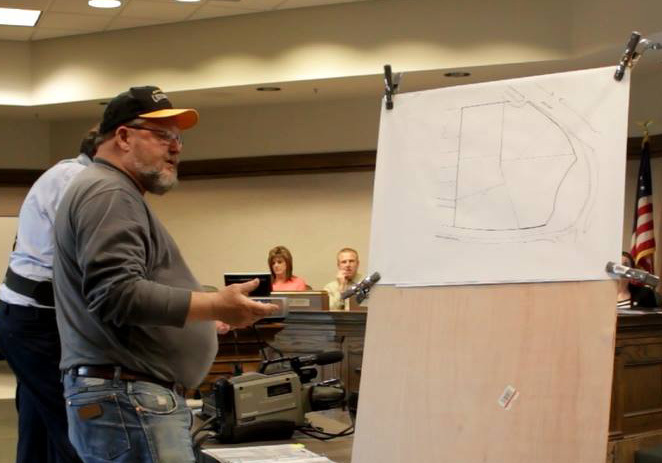 City officials were admonished by residents Robin Haight and Wade Grimm, who claimed the city has, to the detriment of constituents, withheld important information and overlooked codes and ordinances to meet the needs of the Windmill Plaza Subdivision, where a new hotel is planned to be built – something the council and administration members said never happened. Pulling a giant stuffed fish out from under the table and placing it in a large pan on the table, Haight shared photos and examples of “fish stories” with the council to further illustrate his contention with the panel before him. Since the inception of the Windmill Plaza Subdivision was made known to area residents, Haight said, he and Grimm have been treated like second-class citizens. In an effort to protect residents in the Cedar Knolls area, Haight said, it is essential that the whole truth comes to light, without discrepancies. Pulling up a video clip of Cedar City Fire Chief Mike Phillips that was captured from the city’s website of a previous City Council meeting on May 20, Grimm focused his part of the discussion on the cul-de-sac roadway that will require a second exit point to accommodate fire codes in case of evacuation. Grimm passed a paper packet of the 2012 International Fire Code Appendix D to each person on the panel, which he said proved beyond any doubt that the information presented by Phillips that night was inaccurate. With only part of the entire fire code being presented to council and staff, Phillips quickly left the room in an attempt to find a full copy of the code. It was impossible to glean the entire picture of Appendix D without first understanding some of the preceding information in the code, he said. As Haight and Grimm pressed on, Mayor Maile Wilson asked the men to please wait until Phillips had reentered the council chambers so that he could be present as a discussion that required his response was taking place. While waiting, she reminded them that civil discourse is a process that requires a sense of civility and that attacking staff and council with such bold accusations may not be the best approach to finding a sympathetic ear. Unable to find a copy of the fire code on site, Phillips said, he felt as though a resolution was not imminent and the best course of action would be to wait for further discussion until after an independent review is performed at the cost of the residents. The fire code plainly states that when a code official’s statement is brought into question, it is the right of the complainant to have an independent review done, Phillips said. No matter the result of that review, both parties agree that the outcome will be the final word on the issue and no more discussion will take place. At any time when there is a discrepancy with the information being presented, Wilson said, Haight and Grimm are welcome to meet with staff members to discuss the nature of their discovery in a civil way. The whole meeting was “nothing but a beat-up session” on Grimm and him, Haight said, where no meaningful discussion took place. At another meeting with the planning commission, Haight said, half of their presentation was cut off, and important staff members, like City Engineer Kit Wareham, were absent from the forum. As the discussion continued, Wilson made it clear to Grimm and Haight that accusations and connotations of deception, wrongdoing and clandestine meetings would not continue to be a part of any discussion that would be meaningful and cooperative. She asked both parties to gather all their information and prepare an agenda or proposal of some kind that would be made available to staff members prior to a private meeting with them, to be held before next week’s City Council meeting. Grimm and Haight agreed to meet with city officials and prepare something in advance so they can present all the facts they say prove that dirty deeds are afoot. 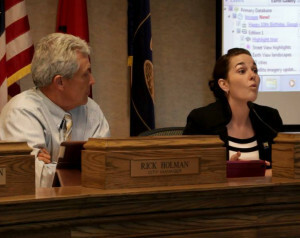 A Thursday morning request for media to be present in the room at the time of the meeting was declined by Cedar City Attorney Paul Bittmenn, who said there was nothing in the books that required such a meeting to be open to the public or the media. 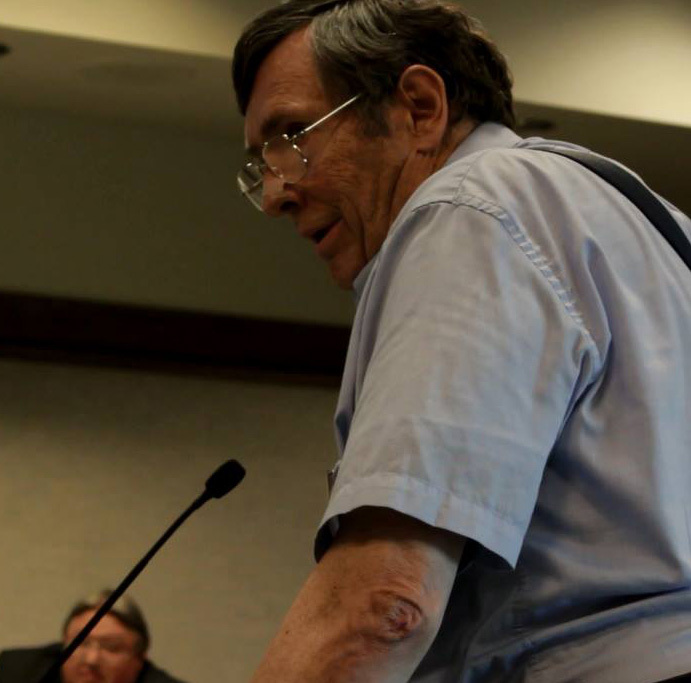 Bittmenn referred St. George News to the mayor, who was in a staff meeting at the time and unavailable to address the request as this report is published. without a backstory I don’t see the point of this article… what exactly is it that they have a problem with? It could be that the property owner broke ground on that hotel project without ever having a building permit. Could be that the land owner and developer of the property went back and tried to cover up that ground had been broken. Could be the City doesn’t provide congruent code enforcement for all. The developer could have been a Stake President who could have donated land for the upcoming temple project. Could be that money, power, and politics still dictate the pecking order in Iron County just like it may have done since its inception. Yet, it is after all “free” news. One might not expect fact finding or potential journalism to actually ensue. Could be someone might actually look into that but that might actually cause someone to do the right thing in Cedar’s heirarchy of good old boys. Public officials deceive public….hahaha, that’s a job requirement!